On behalf of the LTTE, the Special Commander for Batticaloa-Ampara, Mr. T. Ramesh, and heads of the Administrative, Rehabilitation, Treasury and Education divisions, Messrs. Prabha, Thurai, Nizam and Varathan respectively, attended the meeting. The President of the Batticaloa Chamber of Commerce, Mr. Rajan Sathyamurthy, and three GTZ representatives participated at the meeting, the sources said. 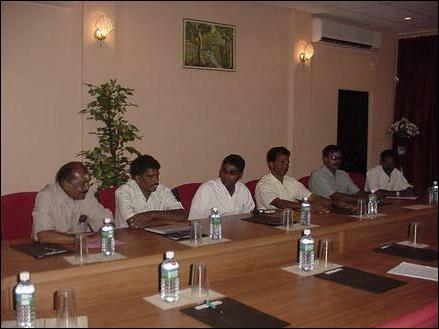 GTZ representatives meeting LTTE leaders in the East at Thenaham in Karadiyanaru. Photos: Ravi. 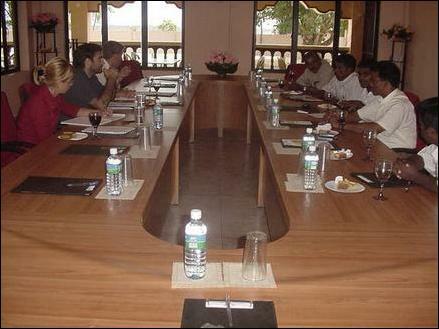 25.07.03 German expert says ground water situation in Jaffna 'alarmin..